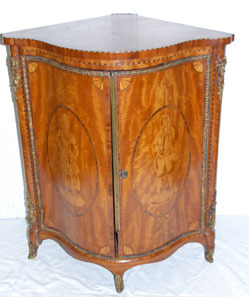 Exceptional Queen Anne cabinet. (Click on image to enlarge). 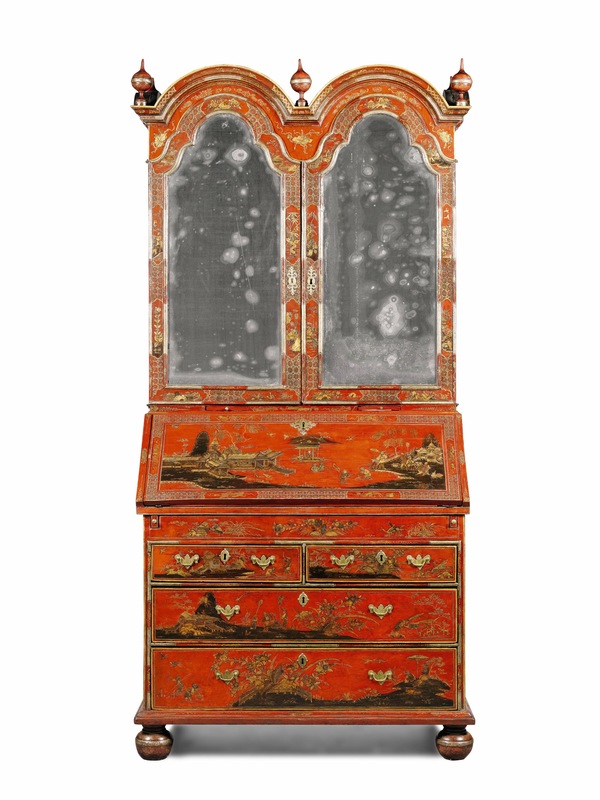 THIS exceptional Queen Anne scarlet, silvered and gilt Japanned bureau cabinet is a feature lot at Sotheby’s sale of Important Furniture in London on December 6. Large bureaux like this one with its mirrored doors are among the glories of Queen Anne furniture. Scarlet “Japan” is rarer than black. 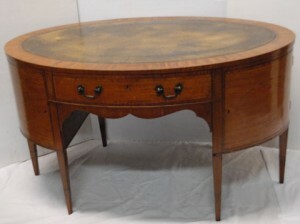 Made just over 300 years ago around 1710 it is in original condition. The piece is estimated at £100,000-150,000. The Lotus and Bat Jar and Cover. (Click on image to enlarge). UPDATE: This was unsold. A Qing Dynasty doucai ‘Lotus and Bats’ jar will feature at Sotheby’s sale of fine Chinese Ceramics and works of art in London on November 9. 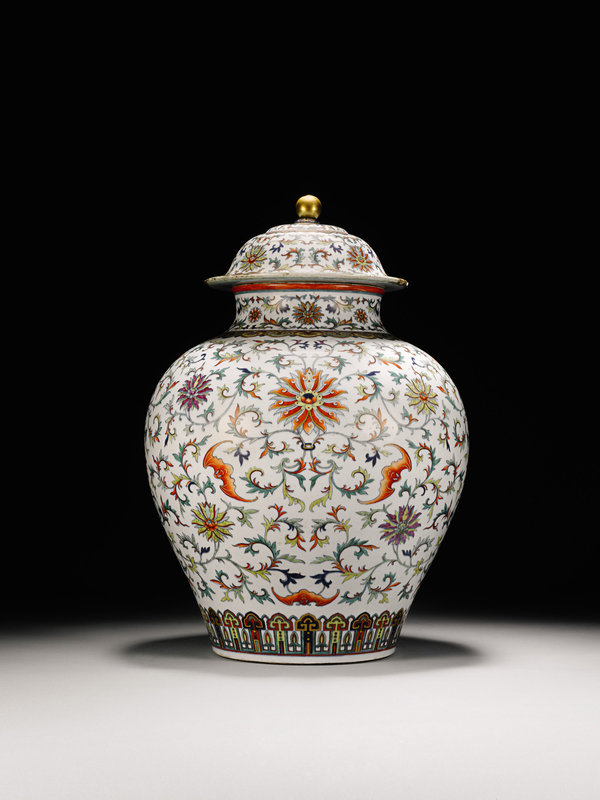 The 18th century jar bears the seal mark of Emperor Qianlong. It has spent 30 years on the diningroom floor of a house in Shropshire, its value unknown. The discovery is made even more exceptional by its intact cover. The jar bears the auspicious Chinese Lotus and Bats motif, expertly painted in doucai or dovetailing colours technique applied to a small group of the highest quality porcelains. This results in an elegant effect of bright colours softly blending into the outlines, of which this jar is a fine example. The estimate for the piece is £300,000-500,000. See post on antiquesandartireland.com for October 17. 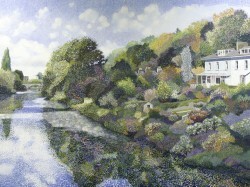 The leafy Cork suburb of Sunday's Well is featured in this work by Victor Richardson. (Click on image to enlarge). Sunspot, Nephin, Co. Mayo is the title of this work by Veronica Bolay. (Click on image to enlarge). The Lavit Gallery in Cork is a survivor in a city where a number of galleries have gone under. The work of artists who have contributed to its success is featured in a group show entitled A View from the Chair. Featuring work by a variety of artists from John Behan and Pauline Bewick to Tim Goulding and Bridget Flannery it has been selected by gallery chairman Ken McCarthy. The Lavit Gallery at Fr. Matthew St., Cork is the exhibition centre for Cork Arts Society. The show runs until November 12. An oval satinwood inlaid writing desk, probably by Butler's of Dublin. UPDATE: THIS MADE 2,200. A Killarney work box. UPDATE: THIS WAS UNSOLD AND IS UNDER NEGOTIATION. 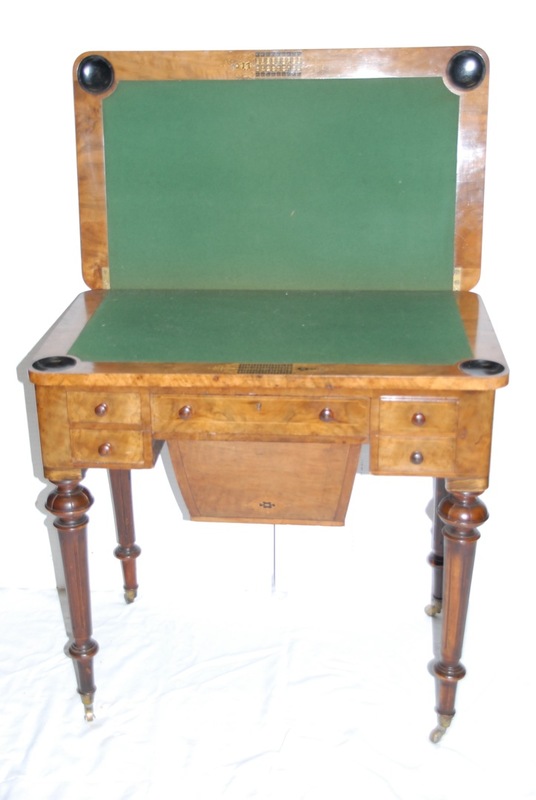 A kingswood and marquetry bureau plat. UPDATE: THIS MADE 1,800. 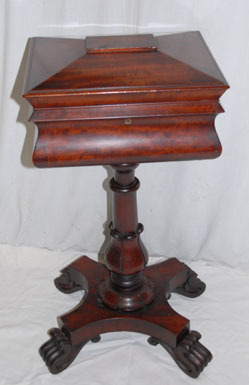 A William IV mahogany teapoy. UPDATE: THIS MADE 800. 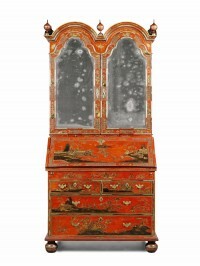 A Georgian inlaid ormolu mounted corner cupboard. UPDATE: THIS MADE 1,800. 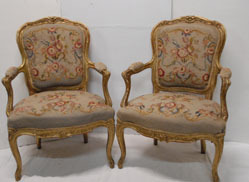 A pair of French gilt armchairs. UPDATE: THESE MADE 2,000. 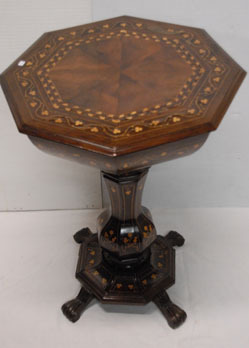 A Regency walnut games/work table at Marshs. (Click on image to enlarge). UPDATE: THIS WAS UNSOLD. Velazquez, Portrait of a Gentleman (click on image to enlarge). A previously unknown portrait by Velázquez highlights Bonhams sale of Old Master Paintings in London on December 7. 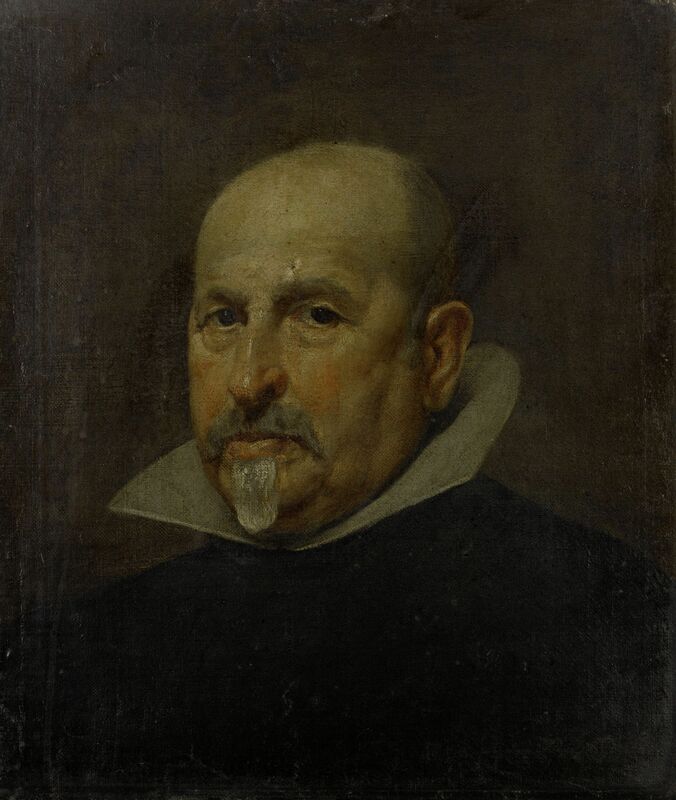 The half length portrait of a gentlemen by the Diego Rodriguez de Silva y Velázquez (1599-1660) is estimated to sell for £2,000,000-3,000,000. In August 2010 a number of works by the nineteenth century British artist, Matthew Shepperson, were consigned for sale at Bonhams Oxford office. The portrait was among these works. It was withdrawn for further investigation. The stylistic similarities to works by the great Spanish master led to extensive research by the department and consultant Brian Koetser; their views were confirmed by Dr Peter Cherry, Professor of Art History at the University of Dublin and one of the world’s foremost authorities on Velázquez and his school. In an article published in the Spanish arts magazine ARS, Cherry writes “the particularized likeness and recognisably lifelike texture, weight and colours of the fleshy face speak of the actual encounter between subject and painter: while the style and technical brilliance of the representation itself betrays its author”. Carmen Garrido, Head of Technical Services at the Prado Museum in Madrid and author of the authoritative work on the artist’s technique, Velázquez: Technica y Evolución was consulted about the painting, and technical analysis and an x-radiograph further confirm the attribution to Velázquez. Roger Moore with that Rolex and Jane Seymour. © 1973 Danjaq, LLC & United Artists Corporation. All rights reserved. (Click on image to enlarge). 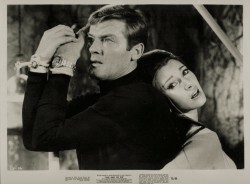 JAMES Bond aficionados might be stirred by the lure of his Rolex from the 1973 film Live and Let Die. Modified by Q the Rolex ref 5513, the most memorable watch to appear in film, comes up at Christie’s sale of important watches in Geneva on November 14. The submariner watch features a bezel spinning at high at high speed to cut ropes and chains. In Live and Let Die it bore an ultra strong magnet designed to neutralise bullets. 007 used it to unzip Ms. Solitaire’s dress. The Rolex was modified for Bond by the brilliant film production designer Syd Cain and the lot is to be sold together with an original construction drawing and two signed images from the set. (est: SFr. 200,000 – 400,000 – Euro 163,000- 327,000). UPDATE: IT MADE 219,000 SWISS FRANCS, $243,959. 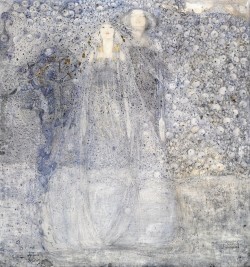 The Silver Apples of the Moon by Margaret Macdonald Mackintosh. (Click on image to enlarge). 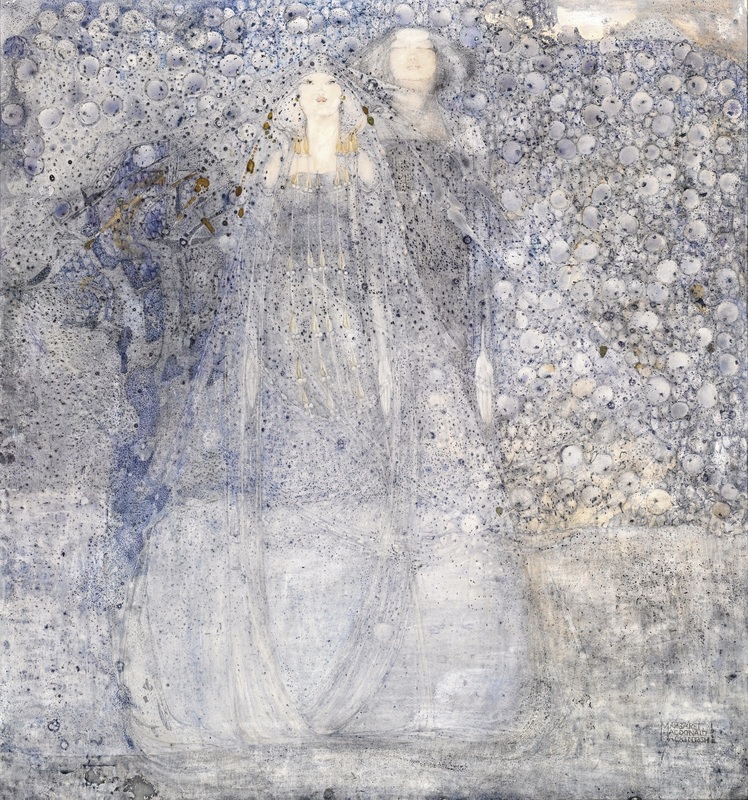 A re-discovered symbolist watercolour by Margaret Macdonald Mackintosh inspired by a poem from W.B. Yeats made £115,250 at Christie’s on October 25. It had been estimated at £50,000-70,000. The title of the painting, The Silver Apples of the Moon, came from Yeats’ poem The Song of Wandering Aengus. It was bought by an anonymous purchaser. Joy McCall of Christie’s said: “We are thrilled about the price achieved for the rare and rediscovered The Silver Apples of the Moon by Margaret Macdonald Mackintosh, which highlights the significance of her work internationally”. 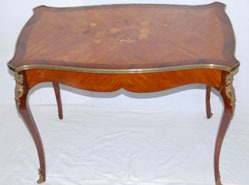 See posts on antiquesandartireland.com for October 2 and September 30. Tinkers Enter the City by Louis le Brocquy. (Click on image to enlarge). UPDATE: THIS FAILED TO SELL. A small le Brocquy to be sold at Sotheby’s in London in November offers a measure of how deeply the recession has reduced expectations for Irish art prices. 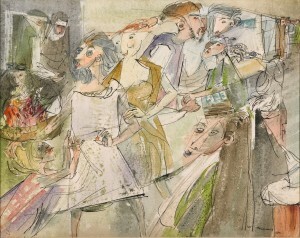 Tinkers Enter the City, a pen, ink and watercolour drawing from 1946, changed hands at a Dolan’s Irish Art sale in Galway for 165,000 euro in 2006. At Sotheby’s the work is now estimated at just £18,000-25,000. 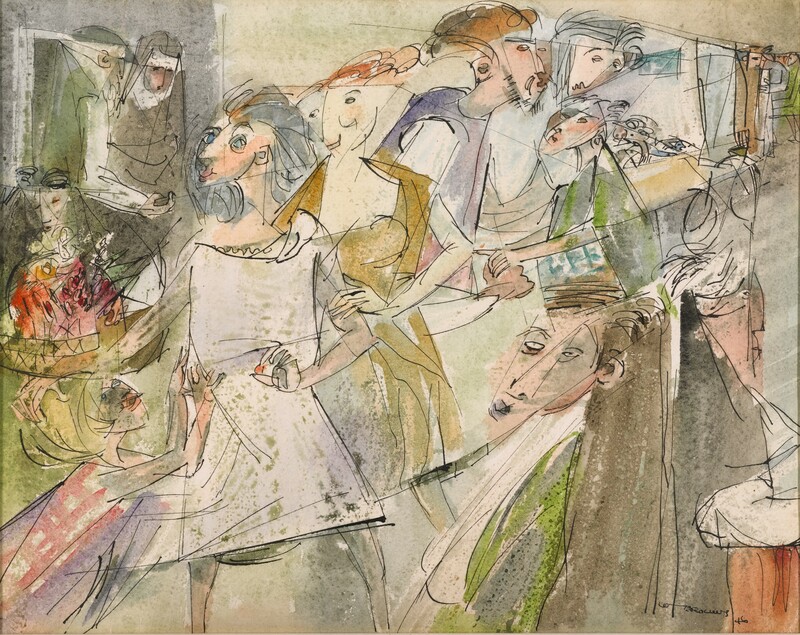 Tinkers Enter the City is lot 163 at Sotheby’s sale of Modern & Post-War British Art on November 15-16 next. It features in the second day of this auction. The same work was sold at Sotheby’s Irish Sale in May 2006 for £78,000. Afterwards it featured in the Louis le Brocquy exhibition at the Hunt Museum in Limerick. Subsequent to that it was sold at Dolans in what turned out to be the most successful Irish art sale ever to take place west of the Shannon. In those heady days Tinkers Enter the City was the top lot in a sale which realised over one million euro. 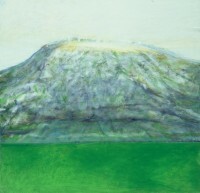 Louis le Brocquy, who turns 95 on November 10, 2011, must be regarded as one of the most bankable of Irish artists. He is one of a very select group of Irish and British artists whose works have made more than £1 million in their own lifetime. Tinkers Enter the City is a work of immense appeal to le Brocquy collectors. In this buyer’s market the lower estimate might not be everything sellers hoped for but it is at least good news for lovers of Irish art as it underlines the value to be had right now. The photo of Oscar Wilde for sale at Bonhams. (Click on image to enlarge). THIS inscribed large format photograph of Oscar Wilde is at Bonhams Books, Maps, Manuscripts and Historical Photographs sale in London on November 22. It is inscribed: ‘Arthur Fish/from his friend/Oscar Wilde/90’. Fish was Wilde’s assistant when he edited ‘The Woman’s World’ from November 1887 to October 1889. When Wilde could not be bothered to write the ‘Literary and Other Notes’ column he would leave Fish to fill in for him. The two men remained in touch after Wilde left the magazine and the photograph may well have been a present to mark Fish’s forthcoming wedding. Wilde wrote to him on August 8, 1890 saying that he would like to see him before his marriage and arranging for Fish to collect the photograph in person. 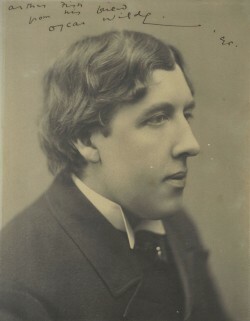 The photograph was owned by Hesketh Pearson whose classic biography, ‘The Life of Oscar Wilde’, was for many years the standard work on the playwright. It is estimated at £4,000-6,000. PRESENTED by Harry Winston with a choice between a 68.90 carat emerald or a 69.42 carat pear-shaped diamond the wife of a Texas oil man opted for the emerald. The diamond was subsequently acquired by Richard Burton for Elizabeth Taylor. For the emerald, Mr. Winston had his legendary designer Ambaji Shinde create the consummate Winston jewel, the magnificent diamond and emerald brooch illustrated on the left. With the rare natural saltwater pearl necklace on the right it will feature at Christie’s sale of Magnificent Jewels on November 29 at the Hong Kong Convention and Exhibition Centre. The estimate for the piece is $2/3 million US dollars. The first half of 2011 saw strong sales and record prices achieved at Christie’s sales of jewellery around the world. Global sales were up 30% compared with 2010. The Spring sale in Hong Kong brought in $89.4 million US dollars and was the largest ever jewellery auction at Christie’s worldwide. See post on antiquesandartireland.com for September 25.